A few weeks ago Archbishop Coleridge of Canberra-Goulburn (Australia), and Chairman of the International Commission for the Preparation of an English Language Lectionary (ICPEL), was gracious enough to provide on request some official clarification about the new Lectionary and its use of a Catholicized version of the English Standard Version of the Bible. It was announced today that Archbishop Coleridge is to be translated to the vacant see of Brisbane in Queensland. Given that Canberra is the nation’s capital, this might seem at first glance something of a demotion. However it is far from a demotion. Canberra is a small city, and even with the rural areas of the diocese included, the Catholic population is small (around 160,000 on 2004 figures). Brisbane is a much larger city, with a significant and well-established Catholic population (over 643,000 on 2006 figures). It has faced some controversy in recent years, not least regarding the schismatic parish of South Brisbane (not to be confused with the faithful remnant who now occupy the church building there) and the media circus surrounding its defection from the Church. It seems clear that Archbishop Coleridge is being trusted with an important diocese that needs a wise and sound pastor at a difficult stage in its history. May God prosper Archbishop Coleridge in his new diocese and may his ministry bear much fruit to God’s glory. Ad multos annos! I’m sure no one saw this coming. After all both Melbourne and Sydney will be up for grabs in 5 years and Mark Benedict will be 69 then and many perhaps saw Coleridge going to Sydney and a red hat. But to be there for 5 or 6 years would be bad pastorally. So Brisbane it is. I had thought perhaps a move to Rome would come but it appears now it will be Brisbane that sees out the pastoral ministry of the eloquent and intelligent Melbournian. 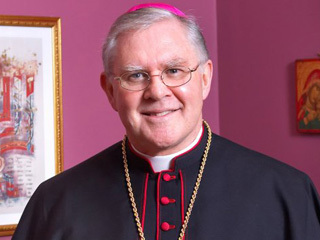 But two major Sees for this bishop mirrors Pell who has lead Melb and Sydney. Well, I am getting some hints here and there that some people did know this might happen, but it was a surprise to me for sure. I take what you say about timing and the previous held hope that +Mark would get one of the two biggest sees. However, I am not so certain that a red hat will elude him. Melbourne has had a cardinal before, Cardinal Knox, who later went on to be Prefect of Divine Worship in the curia. It is not outside the realm off possibility that Brisbane could be graced with some crimson for the sake of +Mark. After all Galveston in Texas got its first ever cardinal a few years back, and it is not by any means a cardinalatial see, so the next archbishop will probably not get one. If +Mark steadies the ship in Brisbane I would not rule a red hat out. This pope thinks outside the box! Brisbane is also a promotion by virtue of being a metropolitan see, whereas Canberra, though titled archdiocese, is not. Quite right that Brisbane is a metropolitan, and that Canberra is of archdiocesan status largely due to its being the nation’s capital. That said, sometimes a lesser-ranked see can be desirable for just such a reason, ie proximity to the seat of secular power. At the same time some might see Brisbane if not as a poisoned chalice then a challenge indeed! No doubt you are right about +Anthony. He will have had a few years as a diocesan himself so he will be the readier for such preferment. A interesting post right there mate . Thank you for posting .